Honeywell Aerospace, Phoenix, AZ, received the 2012 Higgins-Caditz Design Award, for work related to its HTF700-series engine. To manufacture the combustor assembly for its 7000-lb.-thrust propulsion engines, Honeywell fabricates 16 tiled heat shields. Previously, these heat shields were machined from a cast material, weighed 3.8 oz and cost $910 per combustor. Honeywell Aerospace engineers Thomas Johnson and Ronald Pardington redesigned the heat shield as a stamping, reducing its weight and cost. Working closely with Cygnet Metal Stamping & Fabricating Inc., Glendale, CA, the engineers developed the new stamped part from 0.040-in.-thick Haynes sheet. As a result, part weight was reduced by more than half, and its cost by more 85 percent compared to the machined heat shield. The Design Award, created by the Worcester Pressed Steel Co., Worcester, MA, and sponsored by The Quarterly Club, recognizes a manufacturing company for outstanding achievement in developing an innovative product design. Honeywell is donating its $1500 cash prize to the Challenger Space Center Arizona, a local nonprofit organization providing vital science, technology, engineering, and math (STEM) programs to students primarily in grades K-8. Ramcel Engineering Company, Northbrook, IL, received the 2012 Link Systems Process Control Award, for developing an automated high-speed measurement cell used to inspect parts coming off of a progressive lamination die producing 21-piece laminated stacks. The part, used in an automotive electronic power-steering application, requires 100-percent inspection of height, flatness, size and location of ID/OD, and size and location of magnetic window slots. The RamcelVision automated inspection cell comprises a turntable that progresses the product to each station, while a PLC tracks each part in the cell. At each turntable location, a clear glass insert allows part illumination from underneath using a specially designed red lamp. At one station a camera grabs a still image of the 10-mm-tall part; resolution is 4910 by 3280. At another station, three precision contact probes take measurements. Then a sensor detects the difference from the highest and lowest values and determines if the part is in tolerance for flatness. A robot moves acceptable parts onto a packaging conveyor, while rejected parts drop down into a crusher, guaranteeing that rejected parts never mix with good parts. The Ramcel vision system performs more than 80 individual measurements per cycle. The application communicates with a PLC and data server, feeding collected measurements to an Excel spreadsheet to provide Ramcel and its customer 100-percent traceability. While manual part inspection of parts using pin gauges, calipers and micrometers would take 1 to 2 min., the automated cell has trimmed inspection time to 4 sec./part. The Process Control Award, sponsored by Link Systems, Nashville, TN, promotes the application of electronic-analog closed-loop process controls in the metalforming process by recognizing innovative electronic solutions implemented by a North American manufacturing company, which have resulted in significant quality, cost-reduction and/or productivity improvements. NTN already had a part design being produced overseas comprising a stamped bracket that required machining after stamping Instead, Pridgeon & Clay proposed the switch to a progressive stamping of 5-mm-thick stainless steel, which included trim operations to eliminate machining. Key to the success of the project was proving to its customer that the existing design and processes were capable of holding the required tolerances. Pridgeon & Clay and NTN engineers developed tolerance requirements that could be met in a stamped part. They also determined the effects of parts significantly out of round and tolerance, concerned about the impact on bearing life. 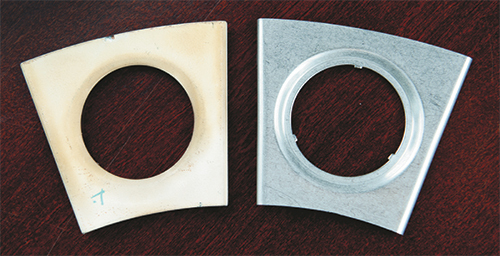 They found that the stamped part exhibited greater elasticity than expected—the material flexed to accept the bearing, rather than crack as would a cast metal part. Pridgeon & Clay’s tooling engineers ultimately determined that a 16-station progressive die, run in its 1250-ton press, could hold the required part tolerances. Moving from a cast part to a stamped design removed more than $8 from the cost of each CV-joint assembly. In addition, the design change resulted in significant weight savings for the OEM. Pridgeon & Clay also received the 2012 Waukesha Metal Products Excellence in Quality Award, for introducing several programs surrounding quality metrics, including development of scorecards used to highlight key metrics in each area of its business. The firm’s quality department tracks progress on the scorecard, which is reviewed monthly by top management. The Pridgeon & Clay quality department streamlined its gauge-planning process in 2010 and enjoyed a 50-percent reduction in the cost of gauge changes. In 2011 the group challenged itself to make another significant improvement, and did so by developing a new document called a Preliminary Dimensional Plan. It’s used to provide the gauge shop with a specific outline of its requirements, mirroring the control plan and supporting the inspection checklist used by production personnel. In addition, during the past year Pridgeon & Clay’s customers required annual validations on all service parts, above and beyond their written manuals. This led the company to review its labor and machine resources. As a result, it adjusted its gauge-technician staff to allow CMM work on third shift, reviewed production-CMM programs being run for ongoing capability studies and incorporated dimensional reports into its validation program. Pridgeon & Clay also introduced several new products in 2011-2012 with extremely tight tolerances, which required the addition of new measurement equipment. The company integrated a new scope to check for chamfers, radii, small teeth and centers of arcs, and a multisensory vision system to inspect fuel-cell components. It’s also evaluating the addition of portable gauging machines (Renishaw Equator models, described as an alternative to custom gauging) to replace CMMs on the production floor. And it’s closely monitoring and addressing CMM-related production-downtime events. With the close monitoring and effective action plans related to metrics, Pridgeon & Clay has set a goal of getting its PPAP records 100-percent complaint to customer requirements, and has improved to 95 percent, compared to 88 percent previously. The Quality Award, sponsored by Waukesha Metal Products, Sussex, WI, recognizes outstanding achievement by a manufacturing company in the development and implementation of a company-wide quality system that effectively uses continuous improvement. Eclipse Manufacturing Company, Sheboygan, WI, received the 2012 Zierick Manufacturing Corporation Productivity Award. 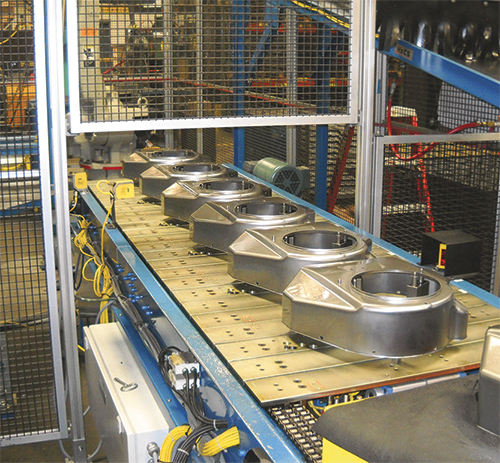 Eclipse, a contract manufacturer of stamped and welded assemblies serving the small gas engine, automotive and other markets, won the award for incorporating a robotic-welding cell to assemble fan housings. The project resulted in dramatic productivity improvements. Due to volume limitations, the original manufacturing plan was to stamp the housing components and assemble parts using manual spot-welding machines. Eclipse was able to justify assembly with a robotic-welding cell when it received additional orders for engine-housing assemblies. Each housing comprises two or three unique baffle components with seven to nine weld nuts. 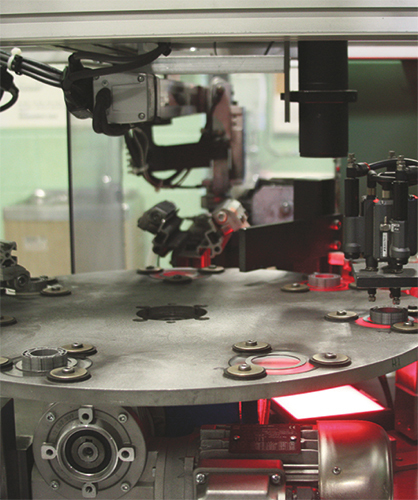 The robotic-welding cell as-designed was budgeted to cost the same as three sets of manual spot-welding fixtures. The custom cell features powered and free conveying equipment. One conveyor can load six sets of components on pallets (shown below), while six fan-housing stampings on pallets move on a second powered conveyor. The conveyors automatically transport the housings and the internal components into the welding cell. The cell employs three robots—two handling robots and one welding robot —as well as a nut welder. The nuts are welded to the housing before the housing passes to the handling robot for locating in a weld fixture. Part-presence and motion sensors track all parts and automated motions, and tool positions. The composite cycle time for the weld cell averages 100 sec. Welding time for one housing type has been reduced by 53 percent, while production volume has increased by 30 percent. Overall savings for the three housings being welded in the cell is estimated at 1.2 man-years compared to manual spot welding. 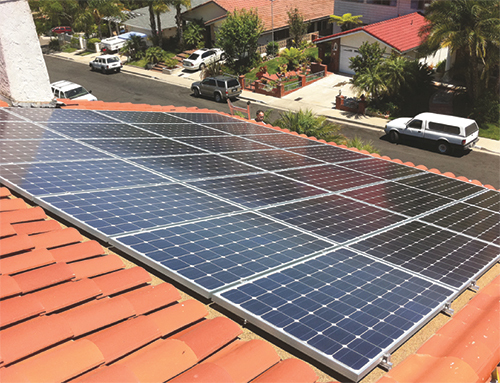 The weld cell was used to provide a 10-percent cost savings to the customer. As a result of the increased scheduling flexibility provided by the robotic-welding cell, Eclipse earned a Supplier of the Year Award for Customer Service at its customer’s annual supplier conference held in April 2012. Unirac Inc., Albuquerque, NM, received the 2012 Pitcher Insurance Agency Safety Award, for its outstanding employee-driven safety and health program responsible for achieving more than three years of injury-free performance. Employing 140 people, Unirac designs, manufactures, distributes and installs photovoltaic solar-industry mounting structures. By using a “from the ground up” approach versus a “top down” management mandate to improve its safety performance, the company has achieved full-scale buy-in from its operators who self-monitor workcell activities, develop safe work practices and enhance material-handling procedures. With the many pieces of equipment employed at the company, the handling of 4000-lb. bundles of raw material via forklifts and a fast-paced environment, the employees’ commitment to safety is evident. In January 2012, Unirac had a surprise OSHA audit with no findings. Select portions of Unirac’s safety program include program oversight and administration at the COO level; use of daily, weekly and monthly safety checklists and data collection that drive safety metrics and KPIs; a documented process to evaluate accidents, incidents and near misses as a means of root-cause and corrective-action efforts; and an employee-run safety team with management involvement and commitment to support the team in implementing their recommendations. As part of the safety program, safety audits are conducted across the factory using “new sets of eyes” from outside the audited area to look for safety concerns that may be overlooked by those who work there every day. Opportunities for improvement are posted and the implementation of the recommendations tracked. In addition, spot awards and employee-of-the-month recognition for self-directed safety-related actions are provided, and employees’ safety efforts are recognized in the company’s pay-for-performance bonus program. Unirac continues its commitment to world-class operational practices with its pursuit of OHS 18001, Occupational Health and Safety Management Systems certification, anticipated by the end of 2012. Diemasters Manufacturing Inc., Elk Grove Village, IL, received the 2012 A.R. Hedberg Training and Education Award for its LISST Training Series, which supports its Diemasters Productivity System (DPS). LISST training incorporates lean manufacturing, inherent simplicity, six sigma, safety first ( a 10-module program) and TS-16949 to create a lean culture, promote the elimination of waste and establish clear focus on how best to satisfy customers. Diemasters employs more than 100 workers who create more than 250,000 stamped parts, assemblies and fabrications daily for the lawn and garden, automotive, medical and aerospace industries. 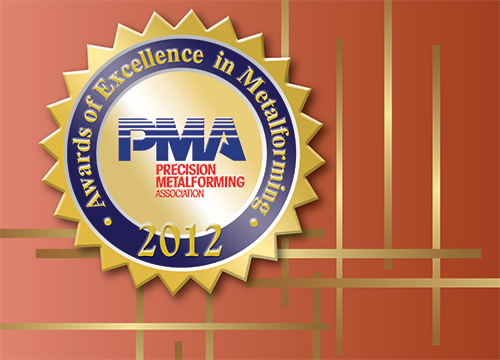 Stake your claim to fame by submitting an entry for PMA’s 2013 Awards of Excellence in Metalforming. It’s your chance to recognize employees, have your company recognized within your industry, and let your customers —and potential customers—know what you bring to the table. Visit www.pma.org/awards to see details about each award, or contact Christie Carmigiano at 216/901-8800 or ccarmigiano@ pma.org for more information. The primary objective of the LISST training program is to guide and support the entire team with the tools and infrastructure necessary to help the company focus on customer, employee and shareholder satisfaction. The firm expects the program to help develop its next generation of managers and skilled team members. All Diemasters employees participate in the training series. Each hour of training is worth a designated number of points. Levels of training achievement include Trainee, The Diemasters Productivity System Practitioner, Green and Black Belts, and Bottleneck Blaster—the highest achievement. As a result of the program, the firm expects to retain a talent pool excited about their work, motivated to advance and looking to develop personally and professionally. The Training and Education Award, sponsored by HPL Stampings, Inc., Lake Zurich, IL, in memory of A.R. (Ray) Hedberg, a leader in employee training, recognizes an outstanding achievement by a PMA member company in employee technical education through a comprehensive training program. Diemasters will present its $1500 cash prize to an educational institution that provides coursework directly enhancing metalforming technology. OCTEC, Medina, NY, received the 2012 Clips & Clamps Industries Educational Institution Award for its outstanding Precision Machine Technology (PMT) program. Under the direction of instructor William Rakonczay, the primary focus of the program is “jobs, jobs and jobs.” Students—currently 24 seniors and 25 juniors—come to OCTEC at the beginning of their junior year. By the end of their senior year, they are expected to be ready for the workforce with, at the very least, good entry-level skills. The program is a mix of theory work and hands-on practice —roughly 2 hours of practical work per hour of classroom instruction. In addition to technical knowledge and practical skills, students must demonstrate organizational skills, responsibility, good attendance, a positive work ethic and all of the attributes that make a good employee. 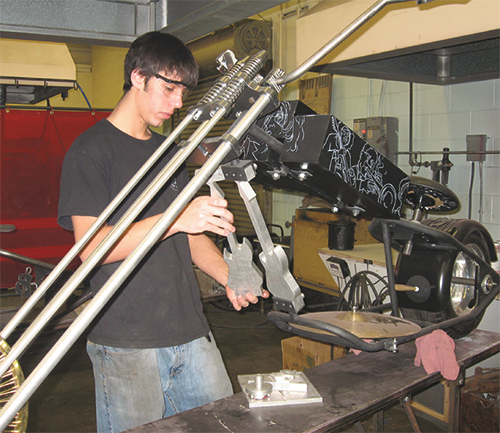 More than 50 percent of the students in the class achieve National Institute of Metalworking Skills (NIMS) certification each year. The OCTEC PMT program is the only secondary program in New York certified by NIMS. Articulation agreements also have been forged with Erie Community College, Monroe Community College and Genesee Community College, through which students may choose to earn college credits. Successful students are rewarded by working in “capstone” placements at local companies. Seventy-five percent of seniors are successfully placed in work-study programs each year. In addition, this summer five juniors worked in internships at local companies and were part of OCTEC’s fall co-op program.